Kind-hearted staff from Bristol Audi have donated toys and teddies to Bristol Royal Hospital for Children. Macfarlane Packaging Sales Director, Jeremy Pilgrim, arranged for the gifts to be delivered with the help of Above & Beyond. 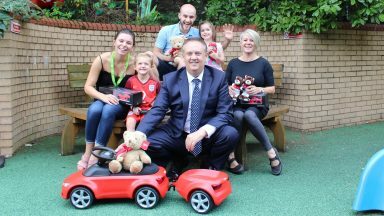 Teddy bears, remote control cars and a ride-along car were just some of the toys dropped off at the hospital’s Play Centre by Jeremy on Thursday (30 August). The Audi dealership are keen to continue the relationship with Above & Beyond and the children’s hospital and deliver more toys in time for Christmas.